With a group of her closest friends and her husband at her side, injured Arizona representative to Congress Gabrielle Giffords has shown an incredible amount of improvement in only a few short days since she was injured by a crazed assassin at a meet-and-greet in front of a Tuscon, Arizona, grocery store. Gabrielle Giffords, who was shot in the head, has started to respond to the voices of others, blinking and moving her arm in response to the presence of her friends. 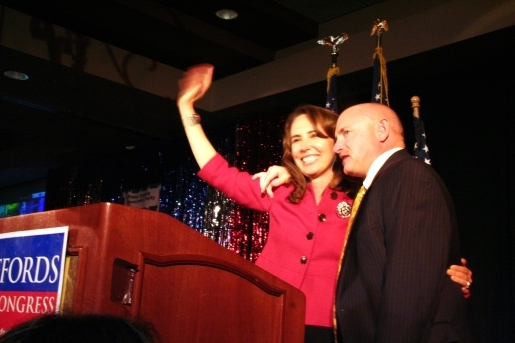 At Gabrielle’s side was her husband, Mark Kelly, her friends and fellow Congresswomen Wasserman Schultz, Kirsten Gillibrand, and House Minority Leader Nancy Pelosi. A few minutes before her recovery, she was visited by President Obama and his entourage.